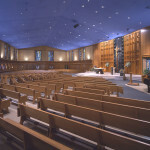 Our team completed a renovation of 11,000sf for St. Winifred Church, occurring on a three week timetable. The schedule included downtime due to previously scheduled church activities. The scope of work entailed installation of new flooring, painting the 25ft ceiling, and resolving asbestos abatement issues. 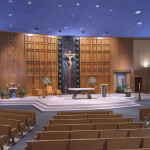 Reconfiguration of the sanctuary required reconstructing the marble altar, installation of new lighting, sound and electrical throughout the space.